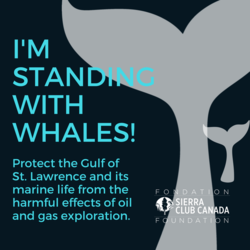 We went to court after a years-long battle to protect the Gulf of St. Lawrence, the Bay of Fundy and the endangered whales who call these special waters home. There's more news to come from the judge adjudicating this case in the next few weeks. Stay tuned! You helped us push back and hold ground to uphold the environmental laws of our country, in addition to demanding fixing broken govenment bodies whose first mission should not be protecting oil projects. 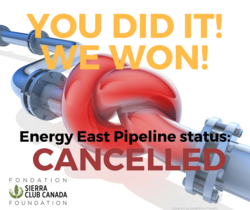 And that resulted in the major victory of the Energy East Pipeline projected being cancelled! From the largest national stories, to ones that strike at the very heart of a community working to protect ecosystems, you were there to lend your support, as was the case in Edmonton, when our Prairie chapter succeeded in securing protections for the last spawning creek in Edmonton. When we talk about "grass-roots" work, this is exactly what we mean. With Bees on The Brink, you stepped up alongside thousands of our supporters to send letters to our government demanding urgent action be taken. We're not finished with this campaign until every last drop of deadly neonic pesticides are removed from shelves and fields. Let's keep pushing on this in 2018! Across Canada, we are working to carve out green space so that millions of people in urban areas have places to roam in a natural setting, unencumbered by vast swaths of grey concrete. We have made significant gains in major cities, and we're not stopping now! 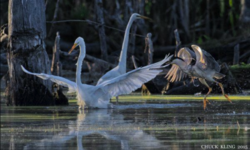 From precious at-risk wetlands, to threatened rivers and creeks, we heard your voice loud and clear and it lent support, for example, when we were seeking protection for important migratory birds in Quebec. Thank you for every time you have shown your support this past year - by signing letters, voicing your thoughts through social media, and by making donations to support this very challenging work. It only happens because of your support.